William Gordon Bowen came to Princeton’s Graduate School from Denison University, where he was Phi Beta Kappa, cochairman of the student government, and Ohio Conference tennis champion. After taking his Ph.D., he joined the faculty as a member of the Department of Economics. In addition to teaching several courses, he continued his research. He prepared a definitive report on the effects of Princeton’s involvement with the government, “The Federal Government and Princeton University.” Following a research trip to England, he published Economic Aspects of Education, an analysis of university financing in the United States and Great Britain. With Professor William J. Baumol, he began a study of the economic foundations of American theater, opera, orchestra, and dance. Their book, Performing Arts: The Economic Dilemma, is a landmark study of the economics of culture. Finally, while on leave of absence before taking over the recently established office of provost, he joined T. A. Finegan of Vanderbilt University in writing The Economics of Labor Force Participation. As provost, Bowen was general deputy to Goheen. During his five-year term he played a leading role in planning and overseeing the move to coeducation, efforts to reach out to minority students, and the defense of open inquiry and free speech. Under his guidance and as part of the Council of the Princeton University Community (CPUC), a broadly representative Priorities Committee was formed to study the manifold needs and capabilities of the University in an age of financial restraint. The budget was brought back into balance, thanks in part to increased financial support from alumni and friends. Princeton’s approach became a model for other educational institutions in the private sector. The American Council on Education circulated Bowen’s reports throughout the nation. He was widely respected for his commitment to quality as well as economy, and for his strong devotion to the special characteristics of Princeton. He was a natural successor to Goheen. During Bowen’s 15 years as president, he was noted for his seemingly endless energy and capacity for work. One hallmark of his administration was his attention to detail — Bowen was directly involved in every major decision made during his tenure and stayed abreast of all issues confronting the University. He took particular satisfaction from the many excellent faculty members who came to Princeton during his presidency and the University’s increasing diversity. Bowen presided over many changes on campus. The residential college system was created during his tenure. Under this system, freshmen and sophomores lived together in one of five residential colleges. * During the Bowen years, five new buildings went up, a dozen others were expanded, and numerous facilities, including dormitories, were renovated. He was also a superb money manager and fundraiser. Princeton’s endowment grew from $625 million in 1972 to more than $2 billion at the time of Bowen’s departure. During his tenure, a major fundraising drive known as “A Campaign for Princeton” met its original goal of $275 million halfway through its five-year schedule and easily passed its revised goal of $330 million. By the time the campaign ended in July 1986, $410.5 million had been raised. 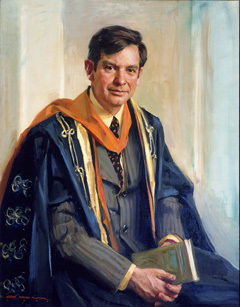 After leaving Princeton, Bowen became president of the Andrew W. Mellon Foundation. *A sixth, Whitman College, opened in 2007, and expanded the residential college system to include upperclassmen and a number of graduate students. William G. Bowen (b. 1933), Ph.D. 1958.